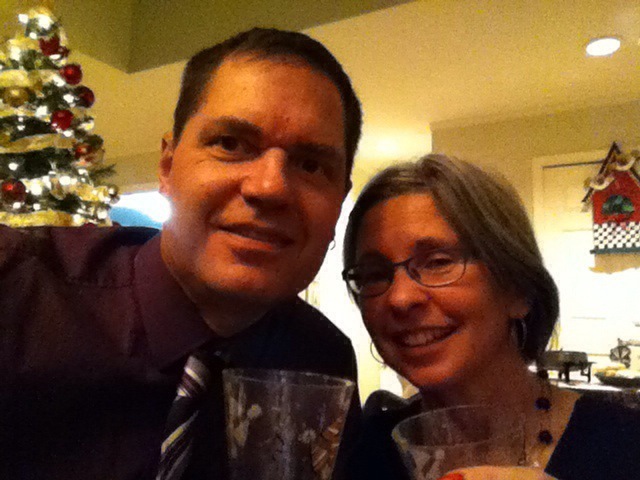 This is an abbreviated New Years Eve version of our blog update. The day started with a very nice visit with Scott and Nora at our house. We are blessed to count them as friends. Randy stopped by after that to formally close the renovation project. We thank him immensely for a job very well done. Janet and I attended a New Years party at one of our neighbours homes this evening where we wisely celebrated the new year on Eastern time so we are home eating ice cream as I write this then saying goodnight. We sincerely wish you all the very best for 2014 and thank you for your love and support. Praying for a year of complete recovery for Janet and for our story to help and inspire many others. No matter how we plan it, our day always seems to start later than intended and that was the case today. We were late enough in getting up that it actually worked in Janet’s favour. I had an appointment downtown that I thought would be our first stop while running a bunch of errands today. There was no need for Janet to be at this appointment and since we were running late I decided to go on my own and leave her to enjoy her toast and coffee in peace. I was gone for twenty seven minutes and I think Janet was disappointed it wasn’t longer. She enjoyed being on her own and was happily sipping coffee, watching The Marilyn Denis Show after finishing her toast and putting the plate in the dishwasher. High five I guess. I’m not really ready to make a habit of this but it’s nice to know she feels confident being on her own. When we finally did get to running our errands it was well past lunch time and Janet kept saying “so what” about lunch and refused to bother with any. I was concerned about that when we got to Connect for a gym session but she insisted she didn’t need any lunch and rolled right to it with Curtis and I. Garrett and Curtis seemed genuinely pleased to see Janet and eagerly assisted in the gym putting Janet through a full workout. Janet showed signs of being away from the gym for over a week and was noticeably slower on the bike but that was after lots of stretching and a good session on the Shuttle. It will be good to get her back into the groove next week. Janet vetoed my suggestion for dinner and requested her favourite, pizza and salad. I agreed knowing she could help make that. She was on the ball in gathering ingredients from the fridge and gadgets from the cupboards and drawers and did a good job helping. Needless to say there wasn’t a crumb left on her plate at the end of dinner and the lack of a nap was starting to show as well. The house hadn’t been vacuumed since before Christmas and there was a pile of dishes to do so there was no time for rest yet. Janet accepted the job of vacuuming and did a decent job. She’s getting better at spotting dirt on the floor and even thought to vacuum the top of the coffee table and the shelf the toaster over sits on. High five. With the house a lot cleaner it was time to clean Janet. Even she was complaining that her hair needed washing and she hates showers. I gave her a bath last week and today got a handheld shower head rigged in our bathroom so we could try that in hopes it would be faster and easier to wash her hair. It worked well but Janet complained of being cold so next time I think we’ll combine the two methods and see what happens. The work was finally done and Janet was happy to sit down with a bowl of ice cream and watch a little TV before bed. She lasted long enough to finish the ice cream and that was about it. Praying for a night of deep, healing and uninterrupted sleep that provides lots of energy, a positive attitude and a willingness to participate fully in everything we do tomorrow. A noticeably quieter day today as it is now just Janet and I at home for the rest of the holidays. We were up a little late last night and had to move through breakfast rather quickly in order to make it to church for eleven this morning. Janet has now graduated from needing a wheelchair designated pew so we sat in the second row and I parked her wheelchair in the lobby. Her transfer to the pew was one of her smoothest yet as I had her lined up well for some easy side stepping. Quite a number of people came by to say hi before the service and Janet is always amazed at how many people know her. Our friends Scott and Nora are in town from Chicago and Nora chatted with us for quite a while commenting that she reads the blog daily. Janet is always amazed to hear people say that and I love it when someone other than me tells her as I get to reinforce to her how many people care about her. That’s why you read this blog. Right? The socializing continued after the service as well with Janet enthusiastically greeting people as we came across them. Confidence is building? After the standard grilled cheese lunch and once the Seahawks game was well underway Janet had a good Skype chat with her mom. She was able to offer some good detail from memory and added more with a little prompting. Things started catching up with Janet later this afternoon and she actually fell asleep on the chaise lounge during the football game. It was only for fifteen minutes or so and needed. She woke with enough energy to get through the rest of the day nicely but only wanted to watch TV. I did get her to practice a few sit to stands from her wheelchair and she continues to improve with those but I am noticing a little less control of the right leg and wonder if we are seeing the Botox wearing off. It’s about that time, if not past it. Could also be the lack of exercise compared to normal. Never the less, her transfers are improving. Our evening entertainment tonight was the classic movie Breakfast at Tiffany’s. No idea why we decided to watch it other than Audrey Hepburn was gorgeous. We found some of the story lines strange but overall enjoyed it and Janet got to bed at a decent hour all set for a good night of sleep. Praying for full and complete healing. Janet had no thoughts of Christmas this morning and rose with anticipation in hopes of spending as much time with Heather as possible before she started her long journey home. The morning was relaxed and centred around the breakfast table. Janet is getting pretty good at making her own coffee and has almost mastered the toaster oven but I need to buy smaller jars of peanut butter as she’s having trouble getting to the bottom of the gigantic one we have now. By the time most people were having lunch we decided to go for a drive up to Big White. Heather had never seen it and Janet didn’t remember seeing it and I would love to find a way for her to enjoy the snow up there with me someday. We planned on having lunch at Santé, which is in the White Crystal Inn and I’m glad we did. The Big White concierge told me we could take Janet up the Gondola to the village but I was very skeptical of that so we drove up to the hotel in case there was some parking there. The front desk staff were very helpful and let us into the private parking garage, gave us a key to a washroom for Janet and made us feel very welcome. Lunch was good and served to us by a girl that recognized us from, Gengie, the sushi place we go to a lot. Celebrity Janet. We were able to get Janet out for a quick look around the village. Of course she got a little cold and I think a lot of that is in her head. She enjoyed seeing it all and I had fun pushing her around in the snow. We didn’t get to check out the tubing area but Janet agreed she would go back so we can do that next time. There was only time for a little more visiting at home before filling Heather up with sushi at Gengie before taking her to the airport. Janet did very well with her chopsticks tonight and hardly spilled anything. Janet really wanted to go inside the airport to say goodbye to Heather knowing she cries the most of all the kids. She did and to my surprise Janet held herself together remarkably well. I can’t explain the lack of outward emotion as Janet definitely feels it on the inside. Oh well, it saves on Kleenex. Janet was very tired by the time we got home but was determined to watch a movie. On Heather’s recommendation we watched Love Actually with me thinking we’d seen it a long time ago. Not so, and Janet found her second wind and enjoyed the movie even though there were so many different stories going on it was hard for her to follow. I’m learning to narrate a little during the film and ask her questions from time to time and that seems to help her. I’m confident Janet will sleep well tonight and am praying she does so and has lots of energy for tomorrow. We are grateful for the time we got to spend with family over the Christmas break, it truly was fun. Heather, you were a huge help, especially in the kitchen, and we pray for a safe trip home for you knowing we will see you soon. Janet faced disappointment as soon as she woke up this morning. The first words out of her mouth were “its Christmas today!” She must’ve been dreaming or something and as I broke the bad news to her she reluctantly accepted it. The morning was spent hanging with Heather and Cam before dropping Cam at the airport. Once again, no tears, maybe she’s saving them all for Heather. Since Connect is so close to the airport it seemed natural to combine that trip with a visit to the gym. Janet seemed to understand the importance of doing so but was less than enthusiastic about it. The place was pretty quiet so with a little hello to Humberto it was right onto the bike. Janet did very well considering she hasn’t been on the thing for a week. I think we will make a few visits next week so she can get right back into it for real the week after. Heather and I offered Janet lunch out but she wanted her grilled cheese at home so that’s what we did followed by a long nap that was clearly needed. Janet was nicely recharged after that and we all enjoyed a very yummy dinner at the Yellow House along with some nice live music from Julie Masi. Janet did not sing along to any of it but enjoyed the tunes, company and food. Thanks for the treat Heather! We all chose dessert at home and watched a little TV as Janet faded after an enjoyable and successful day. Praying for a night of deep and healing sleep and for a fun day tomorrow. Today started a little earlier than others lately as Janet said she didn’t sleep well. I’m not sure how she came to think that as I don’t recall her stirring until very near time to get up. She was talking in her sleep a little just before I turned my light out but that didn’t seem a big deal. Janet enjoyed breakfast with the kids and a nice Skype chat with Andrew, so all were together for a time. We also Skyped with Leslie a little while later and are grateful for the technology that allows us to talk to and see friends and family whenever we want. Now that those moments are more spontaneous, Janet enjoys them more and therefore, I think, benefits from them more. To keep up a little with the walking and balancing practice I had Janet try to replicate her dancing efforts from yesterday. The result today was not as spectacular but I was impressed with how well she was able to get her right heel down to the floor. Much better than yesterday and that allowed her to put more weight through her right leg. Sadly, we dropped Laurel off at the airport this afternoon after a couple of card games with Janet. It was the least emotional airport goodbye I’ve witnessed, I saw no tears, and usually they are flowing fast. Maybe Janet was too tired, or has a better understanding that we will see Laurel again soon, or was just really happy we turned into the airport instead of carrying on to Connect. That will be tomorrow, just for a workout. The evening was spent dining on make your own pizza and drinking a little more wine as we relaxed with Heather. A movie, It’s Kind of a Funny Story, was about all Janet had the energy for and when we finally found one worth watching I wasn’t convinced she’d last through it. She did, but said after that she didn’t really understand it. I think partly because she was tired and partly because it wasn’t a musical. Thanking Laurel for all her efforts in making this a very enjoyable Christmas and praying Janet has a solid night of sleep that provides lots of energy for tomorrow. A very merry Christmas it was here today. There was no mad rush to the tree to open presents so Janet was able to get up when she wanted and enjoy a leisurely breakfast prepared by Laurel and Heather. Courtney joined us near the end and then we did the presents thing. Janet loves opening stuff but more enjoys seeing others react to what she gave them and although we have scaled things way back it was still a fun time. The weather was nice enough for a nice walk around the neighbourhood before a late lunch. Janet was having a rather relaxed day up until that point and I thought the fresh air would be good for her. She was a little quiet as we watched basketball and snacked so to improve the chances of an enjoyable evening I had Janet take a one hour rest break. She probably slept for most of that hour but was awake when I went in to check on her and she seemed ready to make the rest of the day fun. Janet helped a little with the dinner prep and did some really good standing for more than ten minutes while Laurel and Heather made dinner. With some lively Christmas music playing, Janet even got a few dance moves going while holding onto a countertop and briefly a couple times not holding onto anything. The music and business of the kitchen were good distractions to any discomfort Janet was experiencing and she even executed a well controlled decent back into her wheelchair. High Five! Dinner was outstanding and the conversation around the table very enjoyable as we all relaxed and enjoyed wine and laughter. Janet participated fully and even after a more wine than she probably should have she was fully engaged in what was happening and had a really fun time. She surprised us all by calling her own bedtime at ten o’clock when she seemed to be going pretty strong. Good for her to recognize when she’s tired though and she did fall asleep pretty quick. We hope you enjoyed your Christmas as much as we did. Praying for a night of uninterrupted sleep and lots of energy for tomorrow.